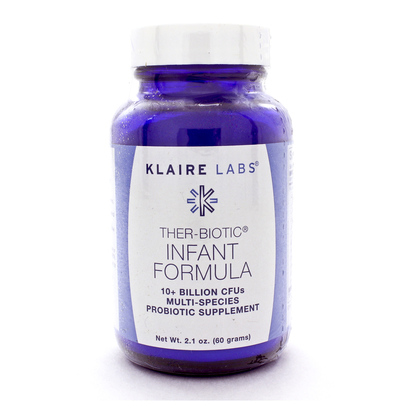 Ther-Biotic is a supplementary formula with lots of probiotic bacteria in it. These probiotic bacteria help revive the intestinal flora and help with the digestion. The Ther-Biotic infant formula is for the infants who are in need of the supplements. The infant’s gut is not fully developed and is only getting the right amount of probiotic bacteria in its intestine. Some children will have a slow process for this, and the Ther-Biotic Infant formula helps them with this until they reach the age of 2 years. The Ther-Biotic infant formula has 10 bacteria from the Lactobacillus and Bifidobacterium strains. These bacteria form an essential part of the infant’s gastrointestinal and immune development and health. The formula is made gentle for the little ones and is in easily absorbing form. The infants who are born out of c-section delivery will have a drastic decline in their intestinal microflora and will benefit hugely with this Ther-Biotic infant formula. Ther-Biotic infant formula is completely hypoallergenic and suits the babies and the toddlers equally well. Why do infants need probiotics? Babies are born with a sterile gut with no bacteria or other microorganisms. They develop these bacteria from the breast milk they take. Usually, the milk they consume is healthy enough but in some babies, that is not enough to have a healthy intestinal flora. They will need additional probiotics. Studies have revealed that the babies who take probiotics have shown lesser bouts of colic complaints. The probiotics help them digest the milk proteins and also boost and help with their immune system. The Ther-Biotic infant formula has 10 bacteria from the Lactobacillus and Bifidobacterium strains. Ther-Biotic infant formula is completely hypoallergenic and suits the babies and the toddlers equally well. Babies who are born through C-section are primarily exposed to the harmful bacteria than the useful ones. They will have the malfunctioning of the microbial flora for a few months up to 6 months. The digestive system will, in turn, favor the growth of anaerobic bacteria as well. To counter this act, such infants can take the assistance of probiotics supplements such as Ther-Biotic infant formula. Lactobacillus rhamnosus is helpful in improving the immune system of the infants. It also improves the population of the other bacteria- Bifidobacterium breve in the formula. Lactobacillus casei is essential for the development of some immune cells to helps the infant distinguish the antigens, toxins, or pathogens. IT also provides the enzymes for the digestion of the milk proteins. Lactobacillus paracasei provides protection against rotavirus, Staphylococcus, and Clostridium infections. Lactobacillus gasseri produces inhibitory compounds against the pathogens Clostridium, Enetrococcus and Listeria. Lactobacillus salivarius increases the absorption of calcium and improves the intestine barrier system. The Bifidobacterium species are the predominant bacteria in the intestine of the babies. They make almost 95% of the total bacterial colonies. These bacteria are responsible for the breakdown of many polysaccharides from the breast milk. It is also helpful for generating the some vital fatty acids as well. Bifidobacterium infantis prevents the occurrence of the necrotizing enterocolitis, the inflammation of the intestinal tissues, widely seen in new born babies. Babies who had low birth weight or are pre-mature are at the risk of this condition. Bifidobacterium bifidum helps reduce allergic reactions in the babies. Bifidobacterium longum can regulate the immune response regarding the respiratory system and normalizes the natural immune functions. Bifidobacterium breve can fight the rotavirus, protect the lining on the ileum and reduce the chances of the growth of anaerobic bacteria in the intestine. Bifidobacterium lactis increases the production of immune cells and modify the digestive flora to work against any inflammation caused by the defense and boost the response to toxins. These bacteria are mixed with the insulin powder, taken from the chicory root. There is nothing else added in the Ther-biotic infant formula, other than the bacteria. Ther-Biotic infant formula is meant for the babies who are 6 months old and up to the age of 2 years. Just mix ¼ teaspoon of the Ther-Biotic infant formula in the daily liquid food. It can also be mixed in a little breast milk and give it to the baby. Do not mix the Ther-Biotic infant formula in warm or hot liquids or food. The heat can kill the bacteria making the formula null and void. The infant formula bottle should be kept refrigerated, definitely away for the slightest heat of any kind. One bottle of Ther-Biotic infant formula contains 2.10 ounce of powder. It can last for 14 weeks approximately 3 months. The white colored powder can easily blend with the food and will not cause any taste difference for the little cunning ones to notice. What are the benefits of Ther-Biotic infant formula? Babies who take Ther-biotic have regular bowel movements and reduced constipation also. The probiotic colony in the infant formula improves the stool consistency. Prevent diaper rash: the acidity if the poop causes diaper rash in many. By supplementing the bay with Ther-biotic infant formula will neutralize the poop. It also prevents the yeast infections because of the presence of the Bifidobacterium species. This works better for those infants who had had to take antibiotics due to some reason. It can be given 2-3 hours after the antibiotics. Continue the use of probiotics even after a week of antibiotics course. The infant thrush, the yeast infection in the mouth of the baby is difficult to get rid of and may take weeks or months. With probiotics this discomfort is easily gotten rid of. The probiotics in Ther-Biotic infant formula improves the digestion in the babies. It helps relieve the gas formation and occurrence of colic in them. The intestinal inflammation is also highly reduced with regular supply of the probiotics. Babies who are prone to urinary infections or ear infections can benefit with the Ther-Biotic infant formula. The Lactobacillus and Bifidobacterium can support the immune system in fighting the infection and the inflammation caused by it. How long should I continue with Ther-Biotic for my baby? Ther-Biotic is safe to use for a longer period if needed. For specific purposes it can be given until the symptoms disappear. Continue the use for another 5-7 days, just to be sure. For uses like thrush infections, relief should be visible within 7-10 days of use. But there are a few babies who had to take the infant formula for months to find relief from the problems. It is not an instant relief formula so you will have to give it some time to decide whether or not it is a failure. Is Ther-Biotic infant formula free of allergens? Yes, Ther-Biotic infant formula is free of common allergens such as milk or dairy products, wheat, gluten, eggs, fish, peanuts, yeast etc. It contains no artificial colors, flavors, or preservatives. It is completely safe for the babies who are allergic to dairy products. Is the Ther-Biotic infant formula a general supplement or used specifically? The infants can always welcome some extra probiotics in their gut so the Ther-Biotic infant formula can be a general supplement as well as a specific supplement. Giving the babies some probiotics at the earliest can improve their health and immune system. They will have fewer allergies, colic, or other digestion related problems, which will be a huge relief for you also. Are the Ther-Biotic infant formula shipped in cold containers? Yes, the product needs to be stored in refrigerator and the same will be shipped in cold storage or containers. To ensure this it would be better to rely on the official site than other external stores who will have multiple sellers for the product. Are there any side Effects and other contraindications of Ther-Biotic infant formula? There are absolutely no side effects for Ther-Biotic infant formula. As for the contraindications, when using along with the antibiotics, Ther-Biotic infant formula must be given after a few hours of the antibiotics. There are no drug interactions for this infant formula and is completely safe. Ther-Biotic infant formula is available in Canada through online purchase. This Klaire product is available in Canada, directly from its official site of the parent company ProThera Inc. For the purchase one needs to register at the site to get the details on pricing and method of purchase etc. Another option is the online store Amazon. Ther-Biotic infant formula is eligible for some attractive discounts and free shipping from there. Lynsey whose 6-week old new born had colic symptoms is now relieved, healthy and happy. Meagan is happy that her daughter is now regular to the bathroom and there are no gas problems anymore. Christina states that Ther-Biotic infant formula reduced the tummy problems for her baby and now more than 6 months. There are no digestive problems, even after starting with the solid foods. Many have vouched that this infant formula is perfect for those babies who are allergic to dairy and soy products. It works well for acid reflux, eczema, colic problems, digestion problems and skin rashes etc. This hypoallergenic product came as a life saver for many and to have happier babies to bring up.